General Beginner Guitar for Complete Beginners will teach you how to play guitar through playing rock songs. The level 1 course starts out teaching you how to play open chords as well as different strumming and picking patterns. You will learn to play songs by popular artists such as The Beatles, Rolling Stones, Bob Marley, Pink Floyd, Coldplay, Adele, Red Hot Chili Peppers and more. You will also learn how to play lead guitar as well by learning popular melodies (licks) within these songs. At the end of the 8 week course you will able to strum chords, pick melodies and of course play full songs comfortably with practice. There is no prerequisite for the level 1 course. 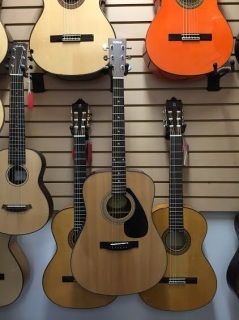 The level 1 course is for students picking up the guitar for the first time. We also offer level 2, 3 and 4 courses for students who want continue or join up already knowing the basics. The level 2, 3 and 4 classes continue with the same learning method. You will learn more advanced picking and strumming patterns as well as power chords, barre chords.